While I haven’t done a Foodie Fieldtrip Friday the last couple of weeks due to dealing with some medical stuff, I realize that I haven’t actually shared with you a couple of cool foodie outings I have done recently. Though I’ve taken along my snapchat (username: blissbakery) friends, I suspect many of you don’t use that form of social media, yet…cuz once you start it’s pretty fun! As well, with the stories vanishing after 24 hours, it is easy to miss out on some of the snaps. This weekend promises to be a massive foodie surprise, but before I go into that I just want to say that one of my secret hobbies is studying supermarkets around the world and analyzing what items and products are sold in them. A whole post devoted to that topic another time though. I think what is sold/bought in a region says a lot about a culture. I don’t have a Phd in Food Anthropology, but since I am a Dr. of “People Watching” (haha) this falls into a similar category. I believe that food is one of the oldest and most powerful forms of communication. Higher education is catching on to that and you are seeing more academic institutions creating degree programs around food writing, food security, food sociology etc. Here is a link that has compiled a list of schools around the globe devoted to various food studies. My fav is the University of Gastronomy in Italy which is defo on the bucket list. This is the place that I mentioned Clodagh McKenna (our most recent #womancrushwednesday) and I were meant to discuss. My philosophy is that you don’t have to have a degree on paper saying you are an expert to actually become one. Malcolm Gladwell in his book Outliers says it takes 10,000 hours to become a master at something. I tend to agree with that. Broken down that is hard work, study, practice and most of all curiosity. Trust me, when I went to university at a mature age, I saw lots of young students literally wasting money on an education when they were all about the recreation. You have to want an education (formal or not) and take initiative to find things out about the world around you. Yet, I think school is great! I love to be challenged intellectually and love to be in a classroom environment. And I feel that you are never too old to learn! That is why I adore the Foodie Fieldtrip Fridays so much! It’s like being an explorer! Here are the links to the ones I’ve done so far in case you want to go back and salivate! I’ve done two food tours, one in the East End and one in the Soho areas of London, one at the Chocolate Show at the Olympia, another at the BBC Good Food Show and the greatest was the trifecta of FFF (Foodie Fieldtrip Fri-YAY!). But I wanted to share a few pics I took while I was on a recent trip to Nashville, Tennessee visiting my son for his military event. I mean, our whole family is foodie related, so there will always be something good to eat around us! 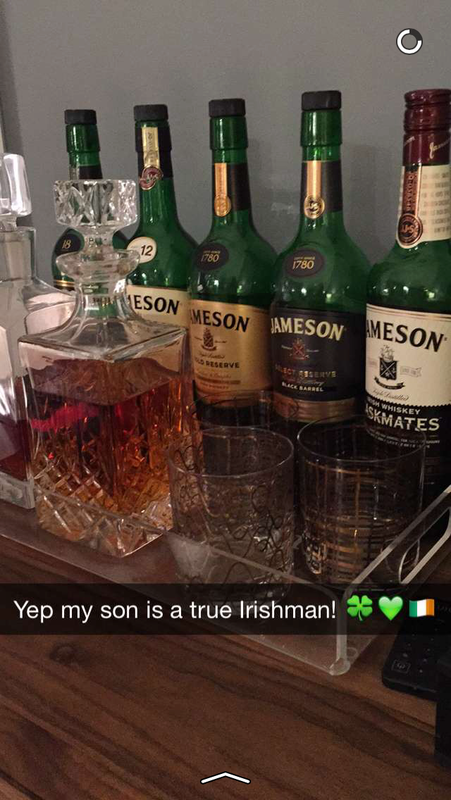 And there might be some good stuff to drink too! 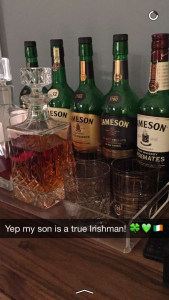 My son does have Irish blood, so I mean, who can blame him for this collection of Jameson’s? In order for me to arrive all the way to the U.S. of course I had to take a plane, duh? But I have never photographed my airline meal until this trip. It actually wasn’t too bad. I know they serve special call ahead request meals, but I did that once and it backfired on me. It was when my kids were small and I thought a healthier option would be a good idea. But when my son was served a fruit platter he was so upset! 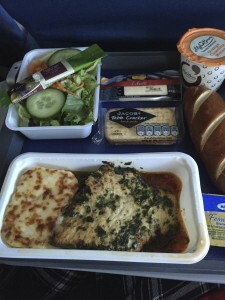 He has always liked airplane food. I kid you not! He said that when he grew up he wanted to open a restaurant in the shape of an airplane that only served airplane food. Well, in his current job, he does eat small meals out of packets when he is deployed, and he does jump out of planes. So kinda close, no? Oh and by the way, we found someone on that infamous flight that was delighted to swap their mystery meat meal for my son’s fruit platter. So happy campers all the way around. 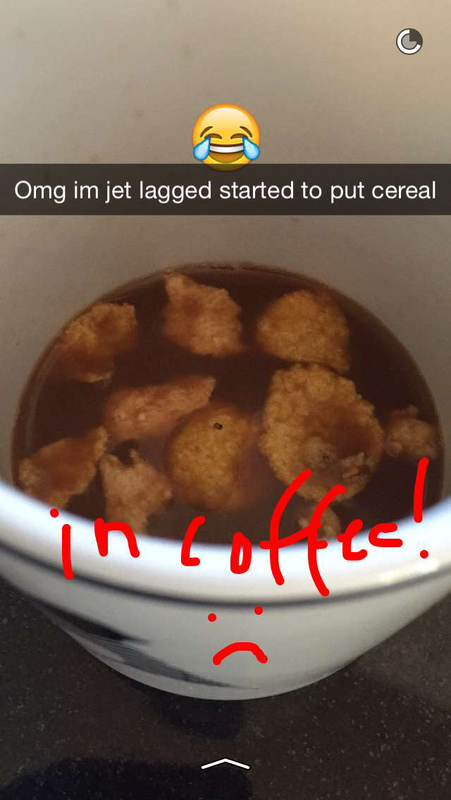 But I wasn’t such a happy camper when the morning after I arrived at my son’s from London I mistakenly poured cereal in my coffee instead of putting milk in it. 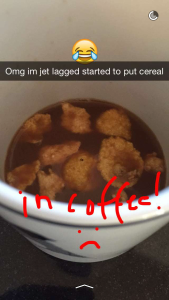 Blame it on jet lag! But after that, the weekend was very delicious! 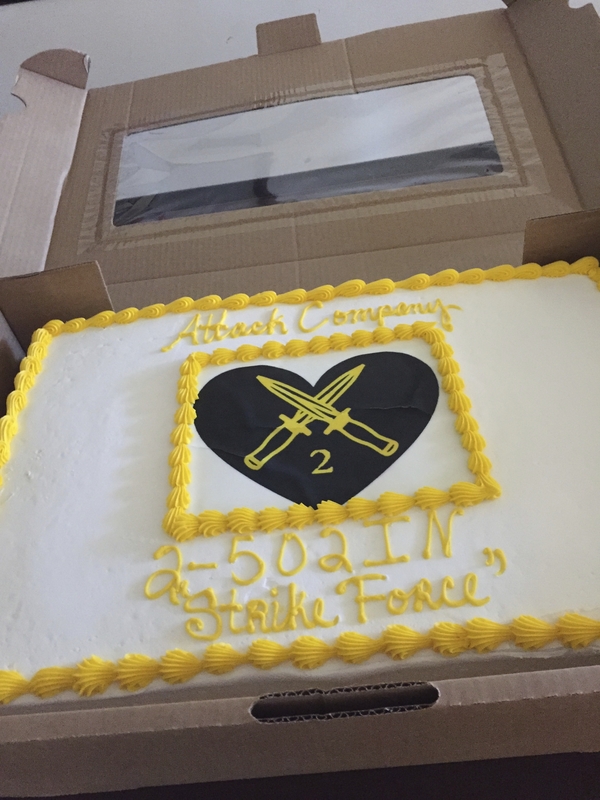 My son is a captain in the U.S. Army as I have shared before, and was having a change of command ceremony. His wife was in charge of providing food for a lunch afterwards for all the soldiers. They were delighted with the chicken lunch she served, and I was in sugar heaven with this giant sheet cake she special ordered. One half was chocolate and the other vanilla! OMG! That evening we went to a restaurant in Franklin (just outside of Nashville) called Gray’s on Main and it was fabulous. I treated my son and his wife to a dinner there for his 30th birthday and he really wanted to go back. It was very dark inside so I didn’t take pictures but suffice it to say, the Lobster Mac n Cheese, Whiskey Salmon, Bacon Wrapped Figs, Charred Brussels, Grilled Pear Pizza, Stuffed Trout and Short Ribs are just some of the items we ordered for the table. And we all had tastes of everything. SSSSOOOOOO amazing! 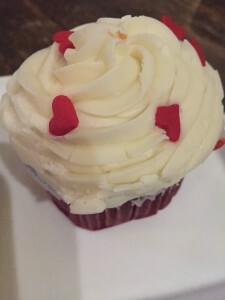 Then my family gave me a special cupcake (a belated birthday treat) in my fav flavor, red velvet! So thoughtful! Not the best pic here, but I just love the heart sprinkles on top! It was a pretty close version of my recipe, which I have shared on here before. We also did some cooking at my son and daughter in law’s home. My son is a master bbq guy so he grilled up some chicken and steaks, my daughter in law made a pasta bake, and I made some salads. I’ve already shared on here the gorgeous cauliflower salad which I served, but I also made a Brussels Sprout Salad that was a big hit as well. It is super simple to make and a great alternative to the usual cooked Brussels sprouts this time of year. It is also very versatile as you can add almonds instead of hazelnuts, or if you want you can add some cooked and diced bacon. Mmmm it is making me hungry just thinking about it! 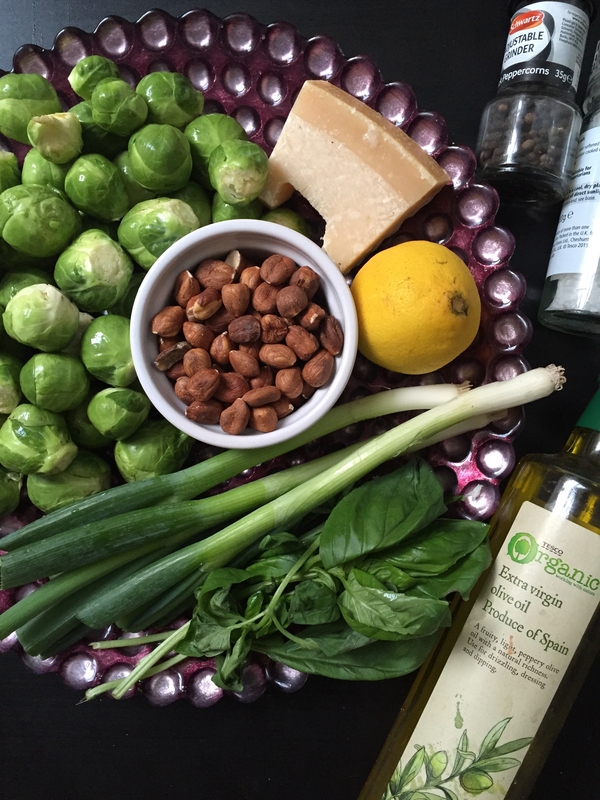 Put shaved Brussels sprouts in a large bowl and add scallions, basil and the hazelnuts. Toss all together with salt and pepper to taste. Meanwhile, mix together the lemon juice, zest and oil. Toss the dressing with the sprouts and the grated cheese and serve. Finally, after a great weekend we said our goodbyes to my son and his wife and took my daughter and granddaughter to the airport for their flight back home that Sunday morning. Then my aunt and uncle and I had time before our flights departed. 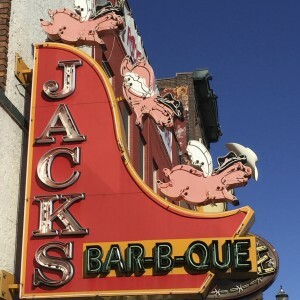 So we did some food touring around downtown Nashville and landed on a very typical Southern BBQ joint called Jacks. 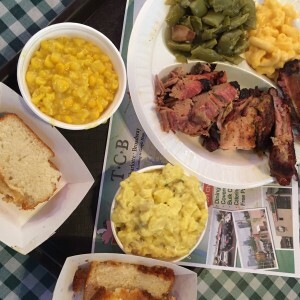 We shared a combo plate of beef brisket, bbq pork ribs, and chicken with sides of creamed corn, potato salad, mac n cheese, green beans and corn bread. Let’s just say that I didn’t eat a thing on the plane ride back to London! Stuffed with a capital S folks! I just love Southern food and the unapologetic dietetic aspect. It is what it is. I don’t think they go in for the picky people asking for gluten free this and dairy free that. But I figure when you are in their territory you just have to go for it! Like I said, that is part of the whole FIELDTRIP of the Foodie Fieldtrip Fridays. I did some snaps of it that day (which was on a Sunday) and wanted to share a snippet on here too! In case you are ever in that area, you now have the foodie hook-up! Nevertheless, I plan on doing loads of snapchatting this weekend for the surprise mega fieldtrip and will write a post all about it. 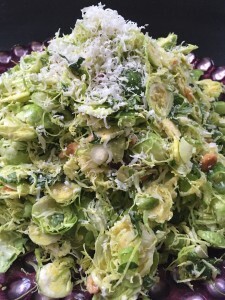 And I will make the Brussels Sprout Salad and put up a pic of that on this post on Monday. So check back if you are curious how it looks. Or, since I have given you the recipe, you can even make it yourself and send me a pic of your creation! Brilliant idea! P.S. As promised, here is the final result…looks like the Matterhorn Mountain of Salads. It is really tasty folks, hope you give it a go! Next > Recipe: I Think I Can Cope with Copenhagen!